What is the program Time Boss Cloud? Time Boss Cloud (TBC) is the small freeware program for parents to change settings of Time Boss Pro on kid's computer or of Time Boss for Android on kid's device (mobile, tablet) from internet. TBC works on all Windows systems and on Android mobile. TBC does not need Time Boss Pro installed. TBC and Time Boss Pro are fully independent programs. Change the last remainig time on current day. Show the last screenshot taken on kid's computer (only for computer). Kid's computer or device can be offline when Time Boss Control is active on parent's computer (mobile). In this case all changes will take effect at first connection of kid's computer (device) to internet. Using TBC you can manage several kid's computers and devices. How to configure TBC correctly? TBC can supports version 3.18 and higher of Time Boss Pro on kid's computer. TBC supports all versions of Time Boss for Android. Please activate in Time Boss Pro the option 'Enable' on panel 'Remote control from parents computer using Time Boss Cloud' (TB->Control panel->Options->Network). The field 'Cloud' should contain cloud.nicekit.com (by default) or nicekit.com. Write the computer identifier from yellow text box (use 'Copy' button at right) to any text file or send it to yourself via email. The computer identifier contains kid's computer name and unique ID, e.g. : 'REM_PC *284c9cfe1-4892-a9eb-9cfecc5760f9*'. Save settings and close the control panel of Time Boss Pro. 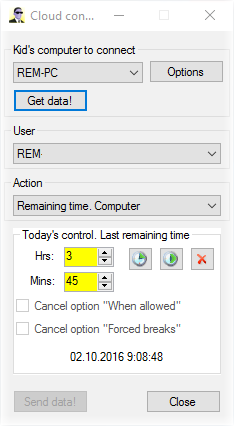 The remote cloud control will activate after 2 minutes after first (since activating this option) kids login in Windows. You should install TBC (no administrators rights needed). For Windows you can download TBC here. For Android mobile you can download TBC here. Attention! If Time Boss Pro is installed on parent's PC, do not use the Time Boss Pro folder for TBC installation! Start TBC (file time_boss_cloud.exe) and open 'Options' window. Open the text file (or the email) with kid's computer identifier and add this kid's computer identifier in the yellow list of kid's computers in 'Options' window using 'Add' button at the right. 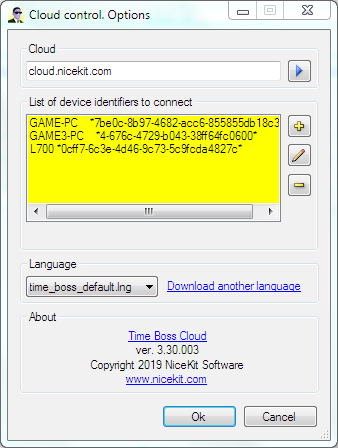 The text box 'Cloud' should contain the same text (cloud.nicekit.com by default or nicekit.com) as the text box 'Cloud' in Time Boss Pro on kid's computer. Close the 'Option' window using button 'Ok'. Now you can try to get settings from kid's computer. Select the kid's computer and press button 'Get data!'. You should input password if the password is active in Time Boss Pro on kid's computer. When you have gotten data from kid's PC you can select any action. On Android mobile use swipe to navigate between actions tabs. Action 'Remaining time. Computer.' 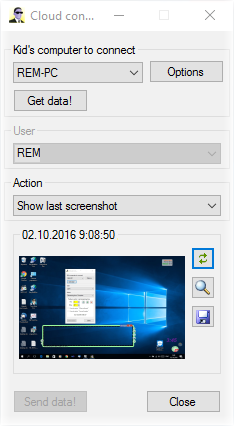 allows to change the remainig time on kid's PC for the current day. When you have changed settings (remaining time for PC, webbrowsers, grants) you should send settings to kid's computer using button 'Send data!'. If the kid's PC is online (connected to internet), all changes will take effect in 1 minute. If the kid's PC is offline, all changes will take effect at first connection of kid's computer to internet. 1. the computer identifier (the text from yellow box in TB->Control panel->Options->Network) should be same on TB PRO and on all TBCs. 2. the CLOUD should be the same on TB PRO and on all TBCs: ALWAYS nicekit.com or ALWAYS cloud.nicekit.com. No special settings in Windows on kid's and on parent's computers (routers) needed. TBC uses the regular (HTTP) internet protocol. The kid's computer identifier is case insensitive, between PC name and first * should be one or more blanks. TBC keeps all settings in simple text file time_boss_cloud_config.txt in TBC folder. TBC keeps the last screenshot in file time_boss_cloud_last_screenshot.jpg. TBC does not use Windows registry. TBC installs in the folder C:\Users\USER\AppData\Local\Time Boss Cloud\ by default. The kid's computer identifier changes when you reinstall Time Boss Pro completely. The kid's computer identifier does not change if you keep settings during Time Boss Pro uninstall. Language files are the same as in Time Boss. 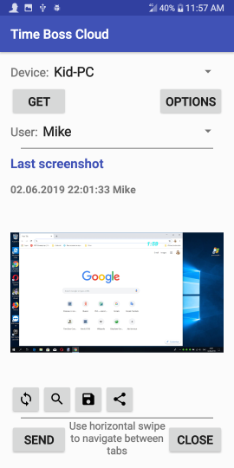 If you can not save screenshots in TBC for Android then create manually the folder TimeBossCloud in Android Pictures folder and try again. With TBC you can create grants, after that kid can use grants for all limited by time items (PC, web-browsers, games, websites...). See also here. The text box 'Cloud' should contain the same text: cloud.nicekit.com (by default) or nicekit.com as the text box 'Cloud' in Time Boss Pro on kid's computer. The system time and timezone should be correct on kid's computer and on device where TBC is installed. 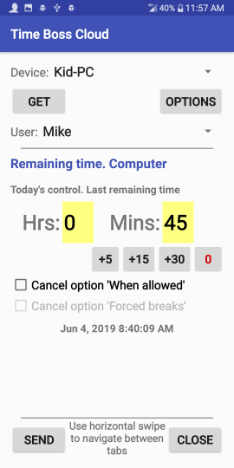 © 2019 Nicekit Software. All rights reserved.